A Decoteak teak shower bench provides your bathroom with contemporary modern style fused with practical shower seating. Our teak shower benches, shower chairs, and bath stools come in a wide variety of contemporary modern styles intended to accentuate your modern bathroom decor. Our DecoTeak shower chairs provide one of the largest ranges of teak shower benches, bath chairs, and shower teak stools in the industry that can enhance your contemporary bathroom designs. We are the pioneer and innovator in integrating shower bench design ergonomic research into our teak bath seating products. Significant furniture design research has shown that providing sturdy arms, and elevated heights on shower chairs can relieve the stress on the joints, bones, and muscles. Why wouldn't you want sturdy support arms to aid you in getting up and down into a shower chair? The shower bench arms provide increased stability, support, and safety for your shower seating. Sitting and standing places significant strain on the hips, knees, joints, and muscles. Our simple design interventions in our teak shower bench include providing increased shower seat heights, along with sturdy support arms. These design modifications have been clinically proven to increase efficiency and reduce strain exponentially. DecoTeak® is the first company that is providing some of the design benefits found in plastic home health shower seats and chairs, fused into a contemporary and modern design concepts that will accent the most elegant of bathrooms and showers. Teak is utilized in our teak shower benches because it is the best wood to use in an humid and moist environment. Due to teak's heavy oil content it is naturally resistant to water penetration, and has been the marine wood of choice for the boating industry for hundreds of years. 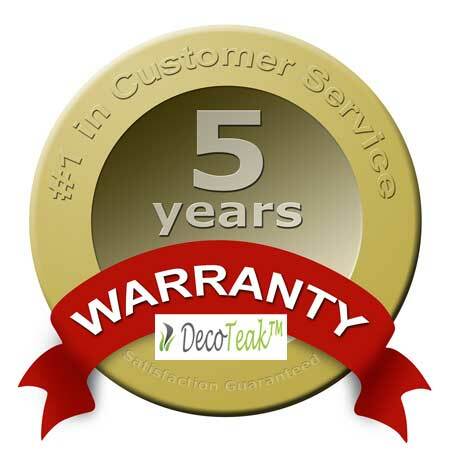 We are confident of our quality and provide both a 30 day satisfation guarantee, and a full five year replacement warranty that covers manufacturer defects.